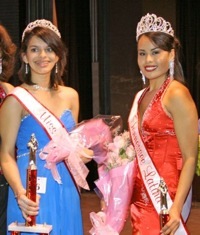 On Saturday, August 11, 2007, Mariela Flores was crowned Miss Tennessee Latina USA 2007-2008, and Audrey Taveras was crowned Miss Teen Tennessee Latina 2007 at Middle Tennessee State University in Murfreesboro. The event was emceed by presenters Jonathan Camcam (Director of Festival de las Naciones) and Mrs. Jill Rivera (Mrs. Tennessee 2007). Entertainment was provided by Danny Salazar as well as Rachel Lampa. The participants competed in personal presentation, modeling, evening wear, and the Miss Tennessee Latina category competed in swimwear as well. One of the primary roles of the future queens is to be a positive role model for the Hispanic community by way of community service. The two winners will participate as representatives of the Latin beauty of Tennessee in the national Miss America Latina pageant, which will take place next year in Mexico. She is a Junior at Morristown Hamblen East High School, with a GPA of 3.6. Morristown She is involved in two community service groups. Mariela currently works as a personal assistant to one of the most productive real estate agents in the city. She plans to attend college at the beginning of next year. One of her biggest dreams is acting. Mariela was born October 2, 1986 in the city of Queretaro, Mexico. She is the daughter of Pedro and Irma Flores. In her free time she likes to read, travel, enjoy time with her family and do community work for the Hispanic community. Nashville toasts new Director: Viva Costa Rica!